The case could have a "chilling effect" on "open justice", defence lawyers say. They include journalists from many of Australia's largest news organisations, including the editors of newspapers The Age and the Herald Sun, as well as prominent TV and radio presenters. A judge banned the media from reporting on Pell's trial, in order to prevent any influence on a planned second trial. Why was Pell's conviction kept secret? The verdict prompted many Australian media outlets to publish articles that referred to the case in some way - although none named Pell. Several non-Australian publications did identify him. 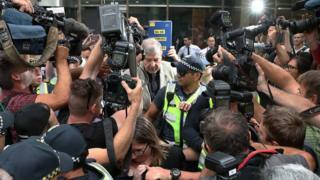 Mr Collins, who is representing all 36 defendants, told a court that none of his clients' media reports had identified Pell or the charges he had faced. "They didn't reference the cardinal - just referred to the fact that there was a broader story that could not be told," Mr Collins said, according to Reuters. He added that the defendants were "not fringe players" but rather mainstream news organisations with no history of breaching court orders. Prosecutors alleged that local media coverage had "aided and betted the overseas media's contempt". Outlets outside Australian jurisdiction are not facing legal action. Judge John Dixon said he was still to decide the whether case should involve one or 36 trials, or "something in between".